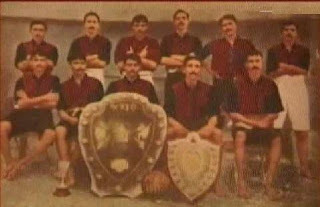 On 29 July 1911, eleven young Bengalis playing for Mohun Bagan scored the most romantic win in the Indian football history. Playing barefoot (except for one Christian player, Reverend Sudhir Chatterjee), they defeated the all-white army team of East York Regiment 2-1 in the finals of IFA Shield on that day. Coming as it is on the background of first wave of Swadeshi, this victory was celebrated as a national victory against the colonial power. This was for the first time an Indian team managed to defeat a white team in a major tournament. The issue became a deeply emotional one as could be seen in battles waged in both Indian and English-owned newspapers of that time. People thronged the Maidan from all corners of the undivided Bengal as well as from neighbouring provinces on that day as Mohun Bagan surprised everyone by reaching the finals. Most of them could not enter the stadium but they finally burst into an unprecedented jubilation as thousands of maroon kites were floated in air immediately after Abhilash Ghosh scored the winning goal in dying minutes of play. 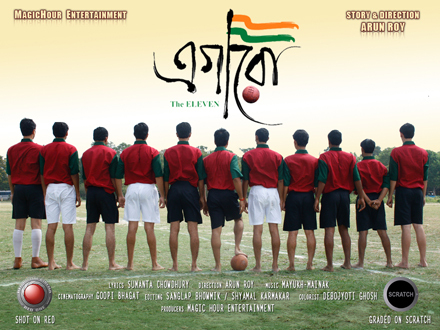 That team, led by Shibdas Bhaduri (his brother Bijoydas was another key member of the team), was hailed by the largest selling paper of the day, Amritbazar Patrika as The Immortal Eleven. The centenary of this famous victory is being celebrated with enthusiasm in Bengal today. A film called Egaro(the eleven) on the immortal eleven and their famous victory has also been released. In the annals of Indian sports and nationalism, it was something akin to the 1983 Prudential Cup victory. An entire country steeped in stagnation for long found joy, pride and self-belief in the summer of 1983. Similarly in 1911, roused with the first stirring of militant nationalism, a suppressed nation found a cause for celebration in that historic victory. There is also a prophetic story associated with the win – when someone told Captain Shibdas Bhaduri that he hoped their win would inspire the countrymen to fight for independence, Bhaduri replied the next time Mohun Bagan wins the IFA Shield, Indian National Flag would replace the Union Jack flying high at nearby Fort William – Mohun Bagan actually managed to win the IFA Shield second time only in 1947! According to traditions, a young Bengali named Nagendra Prasad Sarbadhikari was the first to learn football from the British soldiers in the early part of the 19th century. soon the new game caught on with Bengali youngsters. Coincidentally, Mohun Bagan Club - India's national football club - was founded on 15th August 1889 at the house of a nationalist leader Bhupendranath Bose in North Calcutta's Balaram Ghosh Street. Bose, a noted lawyer, went on to become a President of Indian National Congress. After that epoch-making victory, Indian football progressed from strength to strength. In the 1920s, a barefooted Mohun Bagan defender Gosto Pal – nicknamed the Great Wall of China – became a living legend for his skills in fending off British strikers. A statue of Pal – the first footballer to be honoured with Padmashree – today stands in Calcutta Maidan – close to the statues of national leaders like Subhas Bose, Rashbehari and others – an indication of the importance of football in the national life of Bengal. In the 1930s, Indian national team for the first time started playing against foreign teams. India played in 1948 Olympic and qualified for 1950 FIFA world Cup – though could not participate due to administrative reasons. Most of the Indian players in that team used to play barefoot. Legends like Umapati Kumar and Shailen Manna belonged to this generation. Under the great coach, Syed Abdul Rahim, Indian football enjoyed their golden years between 1951 and 1962. Still mostly playing without boots, India lost to 10-1 to Yugoslavia in 1952 Olympics, but managed to finish fourth in Melbourne Olympics four years later – this, till date, remains India’s best international show. During this period, India was number one team in Asia and predictably this team of P K Banerjee, Tulsidas Balaram, Peter Thangaraj, Samar ‘Badru’ Banerjee and Neville D’Suza (who was the first Asian to score a hat-rick in Olympics in 1956) won two Asian Games (1951, 1962) and a number of other international tournaments. India’s last notable international success came in 1970, when they were placed third in Bangkok Asian Games. Even till mid-1980s, India was a respectable team in the Asian circuit – I will always remember the famous 3-2 victory against Malaysia, when India came back from 0-2 down to win the match, courtesy magical brilliance of Krishanu Dey and his partnership with players like Bikas Panji and Mauricio Alfonso. But for Bengalis, football meant much more than the success of their national team. Football was the ultimate identity – at least for four decades, starting from 1940s. Most prominent expression of Bengal’s traditional East-West (Ghoti-Bangal) debate was the derby between arch-rivals Mohun Bagan (symbolically representing traditional values of settled West Bengal, refined, renaissance-inspired Bengali bhadraloks) and East Bengal (representing Bangals of East Bengal, now Bangladesh -upcoming, not-so-refined but full of energy and verve). As people from the East – who came as refugees in two large waves in 1947 and 1971 – struggled to make ends meet in West Bengal – Red and yellow colours of East Bengal club became a symbol of their fight for survival. How deep was the divide it is impossible to bring out today, it would be suffice to say that every keenly contested league or Shield match produced millions of heart burns and broken relationships. Best friends never spoke to each other again, marriage proposals were turned down - a number of stories and novels found their perfect theme in this rivalry and in at least three mainstream Bengali movies, the real tension was built up around East Bengal- Mohun Bagan rivalry. Also closely connected with this contest was the prices of two of the most favourite fishes of Bengalis – Illish (or Hilsa for Mohun Bagan) and Chingri (or Prawn for East Bengal) – prices of one or the other would skyrocket depending on which side comes out victorious. A membership of Mohun Bagan or East Bengal was a badge of honour. Watching every match of your club - braving rains, wooden stands and horse-mounted police were some of the symbols of ultimate devotion. Needless to add, footballers were absolute heroes (and of course if the team loses biggest villains!). Another huge annual excitement was the actual signing of players – they would be kidnapped and kept in safe houses and each and every movement would be followed keenly by news-hungry millions in daily papers till the dust settles on that year’s transfer drama. 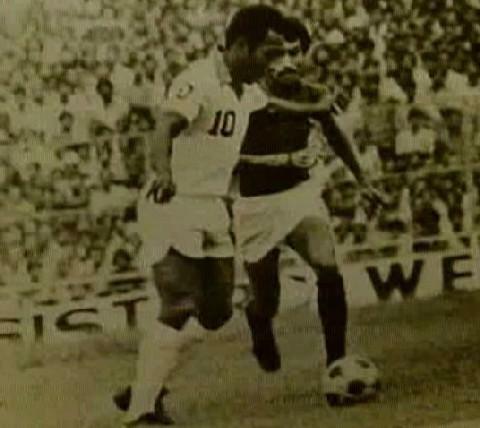 Throughout the golden period of Indian football history and even in the 1970s, Mohun Bagan as well we its rivals depended on Indian players and not merely on Bengali players. But the situation started changing from the 1980s – first came a bunch of Iranian players – Majid Basker and Jamshed Nasiri in particular enthralled the Calcutta crowd. And then came the biggest star of Calcutta club football – a Nigerian student, who discovered his football genius in Calcutta – Chima Okorie. For the first time in its history Mohun Bagan changed its rule to sign him as the first foreign footballer. Chima was followed by a number of Nigerians but only two of them became real heroes – Emeka Ezeugo and Chibuzor. Emeka briefly appeared as a substitute player in the 1994 World Cup for Nigeria – providing great excitement for football-crazy Calcuttans. Two world cups of 1986 and 1990 changed this picture forever. 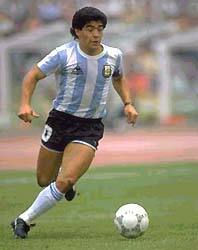 Those of us grew up preserving paper cuttings of Krishanu-Bikas or Chima-Emeka overnight discovered Rummenigge and Ruud Gullit, Rene Higueta and Carlos Valderama, Roberto Baggio and Gary Linekar and above all a God named Diego Armando Maradona. In our class rooms and para adda, we were no longer shouting for Mohun Bagan and East Bengal – first it was replaced by Brazil-Argentina and then as we got to watch European club football, Napoli-Juventus-Sampadoria debate (highlights of Italian Serie A matches were the first to be telecast with expert commentaries by P K Banerjee and others). Today, routinely on weekends, we join rest of the world in cheering for Man U or Chelsea or Liverpool. Very few of my generation of football crazy Bengalis would know the name of India captain today, forget about Mohun Bagan and East Bengal (as school students in mid-80s, greatest pride for me and my friends was in the fact that the then Indian captain, Sudeep Chatterjee was an alumni of our school). You would still find considerable crowd and die-hard fans of Mohun Bagan or East Bengal in Maidan today exactly like over-crowded narrow streets of North Calcutta, from where Mohan Bagan started its journey more than a century back. As miasma of a dead civilization envelope North Calcutta, much the same way Bengali football tradition disintegrates into a non-entity.